The Organisation for Economic Cooperation and Development (OECD), whose members comprise the world’s major economies, has significantly cut its growth forecasts for 2014 and 2015 and warned that financial markets could face increased turbulence when the US Federal Reserve begins to increase interest rates. Further indications of when the US Fed might take that step are expected today after its open market committee meeting. Most attention will focus on whether the Fed continues to say that its benchmark rate will remain near zero for a “considerable time” when its program of financial asset buying ends in October. In an “interim” assessment, the OECD said it expected a growth rate in 2014 of 2.1 percent in the US, 0.8 percent for the eurozone and 0.9 percent for Japan. This is a downward revision for each of these economies of between 0.3 and 0.5 percentage points. The trend will continue in 2015, with the US economy predicted to grow by 3.1 percent, compared to the previous forecast of 3.5 percent and the eurozone by 1.1 percent, down from the previous estimate of 1.7 percent. Continuing slow growth in the euro area was the “most worrying feature” of the OECD’s projections. Growth had been “disappointing” in the largest economies—Germany, France and Italy. “Confidence is again weakening, and the anaemic state of demand is reflected in the decline in inflation, which is near zero in the zone as a whole and negative in several countries.” There was a risk of slipping into outright deflation, which would perpetuate stagnation and increase the real debt burden. The vicious debt-deflation circle is exemplified in Italy. The country’s debt reached almost 136 percent of gross domestic product (GDP) in the first quarter and is predicted to rise to 145 percent by next year, despite a series of austerity programs. The OECD noted that real wage growth remained “very weak in many countries” and this was holding back a stronger recovery in consumer spending. A graph showed real wages grew by only 0.2 percent in the US from 2009 to 2014, while in Japan and the euro area they declined. In all three areas, labour productivity growth was near 1 percent or more. In other words, any economic growth is flowing almost exclusively to profits. The OECD did not deal in much detail with China, except to say that policy settings were consistent with “an orderly growth slowdown.” Inflationary data indicated “ample room” for stimulus measures should they prove necessary. Other reports, however, are starting to sound the alarm bells over the Chinese economy. Evidence of a deceleration came last weekend with the news that the increase in industrial production for August was 6.9 percent year-on-year, the lowest level since 2009, during the global financial crisis. The Wall Street Journal reported that several financial institutions had lowered their growth projections for China, with predictions that it could fall below the official 7.5 percent by as much as 0.3 percentage points. The newspaper’s report noted there was evidence that the real estate slump, which has been occurring for some months, was starting to spread, with weakening conditions in many related industries, including steel, flat glass, cement and consumer white goods. Foreign direct investment (FDI) in China was down 14 percent in August compared to a year earlier, following a 17 percent drop in July. 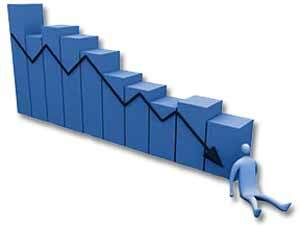 This is first time FDI has dropped by more than 10 percent in two consecutive months since 2009. There is widespread recognition that the days of 10 percent-plus growth have gone. The question is how fast the Chinese economy will slow and how this will affect the rest of the world, especially South East Asian economies that produce intermediate good for Chinese factories, and raw materials suppliers such as Australia. The OECD expressed concerns over what might take place in financial markets once the Fed lifts interest rates. “Many emerging markets” were vulnerable to financial shocks because of the build-up of debt, especially corporate debt, in recent years. “The anticipated tightening of US monetary policy could lead to shifts in international financial flows and sharp exchange rate movements that would be disruptive, especially for some emerging economies,” it said. An article published by Bloomberg on Monday said 100 of South East Asia’s largest publicly traded companies were becoming “more vulnerable to default as their debt surges and profitability weakens.” With average economic growth across the region falling to just under 5 percent last year, from 8.5 percent in 2010, companies are turning to debt rather than profits to finance expansion. “More and more debt is financing less and less growth,” a Singapore-based analyst for Standard and Poor’s (S&P) told the news agency. S&P issued a report stating that blue chip companies in the region will face increased vulnerability when interest rates rise. Some indication of the possible turbulence has been provided by the movement of the Australian dollar over the past week. After hovering around 94 cents to the US dollar for months, it suddenly fell to below 90 cents earlier this week. The rapid movement was attributed to possible interest rate moves by the Fed, which will tend to send the value of the US dollar higher in international markets, as well as concerns over the Chinese economy, upon which Australia is dependent. These sentiments are broadly in line with those in the quarterly review of the Basle-based Bank for International Settlements (BIS), issued last Sunday. It said companies in developing countries had issued almost $375 billion in debt between 2009 and 2012, more than double the amount in the four years before the 2008 crisis. In other words, once a shift out of these markets begins, it could turn into a rush for the exits, in which each fund tries to get out before incurring significant losses, thereby triggering a crisis.